Which the pious honor with rational faith. 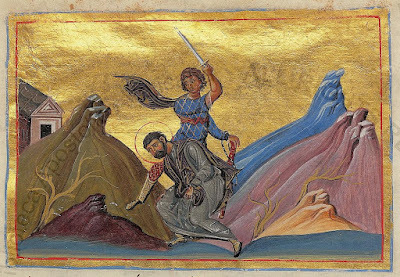 Saint Synetus, whose name in Greek means “man of reason,” lived during the reign of Emperor Aurelian (270-275), and became a Reader in the Roman Church at the proposal of Pope Sixtus (257-258), who was a hieromartyr and is commemorated by the Church on August 10th. One day Synetus saw Aurelian offering sacrifices to idols, he confronted him with arguments, and ridiculing him he promised that he too would sacrifice. When the emperor invited him to fulfill his promise, Synetus admitted that he spoke such words as a joke. Aurelian was not amused, so he ordered for Synetus to be flogged with an ox hide, and he was thus beaten to such an extent that the entire ground became red with his blood. After this he was thrown into prison. On the following day, Synetus was taken from prison and laid out over a fiery gridiron. It was then that he heard a divine voice from above, which strengthened him and motivated him towards martyrdom. With this voice came a fierce storm, which extinguished the flame and kept the Saint unharmed. After these events, a deep pit was dug by imperial command, to the depth of ten cubits, which is about fifteen feet. The pit was lined with sharp and cutting wooden stakes. The Saint was then thrown into the pit, and on the way down nearly all his bodily members were cut to pieces. However, when he landed on the ground, he was preserved whole by divine providence. With this having failed, the pagans took Synetus and locked him inside the Pantheon, which is a temple in Rome that contained idols of all the gods. While confined in this demon-infested temple for twelve days, the Martyr destroyed the idol of Zeus and an angel of the Lord miraculously opened the door of the temple for him to leave. Thereupon, Synetus went and distributed the shattered gold pieces to widows, orphans and the poor. Not wanting to lose his opportunity to complete his contest and finish his life as a martyr, Synetus then presented himself once again before Aurelian. Enraged by all that had taken place, the emperor ordered that Synetus be executed by decapitation. In this way the holy Martyr received the crown of martyrdom.